Virginia Gov. 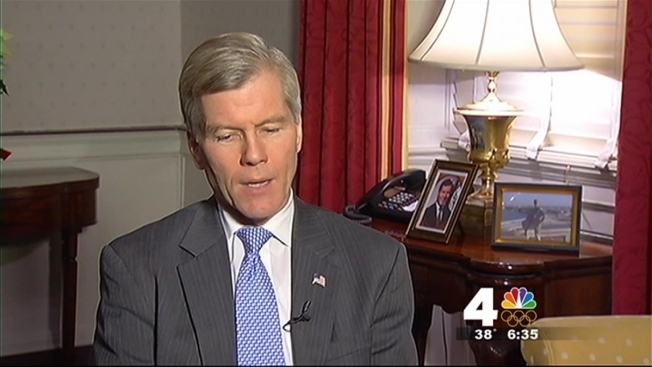 Bob McDonnell enters his final month in office this week, and he's taking time to spotlight his administrations' achievements. In a 30-minute interview with the Northern Virginia Bureau at the executive mansion, McDonnell reflected on his achievements but also answered questions about the gifts scandal that threatens to tarnish his legacy. McDonnell acknowledges that northern Virginia residents in particular might see the landmark transportation funding plan as his signature achievement. But the governor says he believes his education reforms -- an A-F grading system for schools, the takeover of failing schools and a focus on more higher education slots -- will have more impact in the long run. But the Governor's successes are often overshadowed by the lingering federal investigation into whether there was any criminal wrongdoing when McDonnell and some of his family members accepted gifts from Jonnie Williams, a political donor and the then-CEO of nutritional supplement company Star Scientific. McDonnell adamantly denies any wrongdoing and says he hopes his record will be judged on far more than the scandal-plagued final months. The Northern Virginia Bureau will have more from this interview Thursday on News4 at 5 p.m. and 6 p.m. and on NBCWashington.com.